NOTE: THIS IS A HOBBY WEBSITE. IT IS NOT A BUSINESS OR A SERVICE SITE TO FIND A HOME FOR YOUR TILLER. EMAILS CONCERNING THOSE SUBJECTS WILL NOT BE ANSWERED! 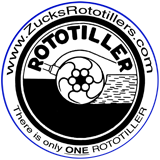 Most of the information I have deals with ROTOTILLER brand rototillers. That includes the Frazer ROTOTILLER and the Roto-ette and Rototiller brand manufactured in Troy, NY.